Common Core Standards are so great, it needs a hefty “Multi-Tiered System of Supports” to ensure success. Earlier in March, I wrote about the Wake County School Board basically dismissing teacher concerns captured by a recent survey. That survey included the nugget that, “only 50% believe that all students can meet grade level benchmarks given sufficient supports”. 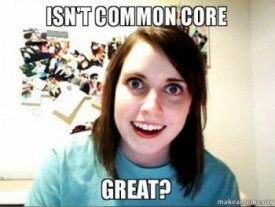 In that earlier article, it was noted that the Wake Board ignored Common Core as a factor yet again and instead, called for ‘more support’. That support comes in the form of MTSS, which stands for Multi-Tiered System of Supports. MTSS has a predecessor, which was called RTI (Response To Intervention). Unlike RTI, MTSS seems to be specifically tied to supporting Common Core. I promised I would have more on MTSS and I keep my promises. What follows is basically a dossier on MTSS. Readers can browse through what I’ve found and make what they will of it. MTSS appears to have gained popularity in 2012, when many states were a year or two into Common Core implementation. When Googling MTSS, the first results that pop are in Florida. In the list below, note that California’s documentation specifies that Common Core is the prime purpose for using the MTSS framework. Two other reports that detail the connection between Common Core and the use of MTSS come from Scholastic and the Council of Great City Schools. It is worth noting both rely heavily on data and both have emphasis on ‘behavioral’, ‘social’ and ‘parent engagement’ factors. “More recently, the adoption of the Common Core State Standards (CCSS), where all students are expected to demonstrate mastery of a new, more rigorous set of educational standards, provides an additional justification for a model that encompasses the needs of all learners, regardless of whether they are struggling or have advanced learning needs, and provides a clear, systematic approach for intervention when students are not on track to mastering these standards (Common Core State Standards Initiative, 2010). The Common Core State Standards are designed to help students prepare for meeting rigorous college and career expectations. The standards require individuals to have a deep understanding of academic content and the ability to apply that academic knowledge and skills. To get students ready to meet these standards, school districts and schools will need to provide not only higher quality instruction, but also instruction that is more integrated across subject areas than ever before. A Multi-Tiered System of Supports is completely consistent with the Common Core State Standards. However, MTSS builds on these standards to provide a framework and a set of critical tools and additional time to support teaching and learning at differing levels of intensity, depending on the academic needs of the students. In other words, the CCSS articulates the “what” in teaching; and MTSS provides a framework for “how and when” to provide it. In short, MTSS employs a problem-solving process that helps match instructional resources and focus to educational needs; makes the instructional adjustments necessary for continued improvement in both student academic performance and students’ rates of progress; and assesses the effectiveness of instruction/interventions on student outcomes. MTSS is also designed to be preventive in nature because it uses a variety of early warning signs to ensure that educators can work to accelerate student progress before it is too late. Furthermore, MTSS provides an earlier and more appropriate identification of students who are not on track academically, and allows differentiated instruction and intervention as soon as a need is identified. So, students do not have to exhibit significant academic failure or behavioral difficulties before they receive support. In addition, using a tiered, systematic, and schoolwide approach—which links socially appropriate behaviors and student engagement in academic work into a seamless system— has the great potential to increase student engagement in learning and reduce behavioral and disciplinary distractions. In this way, academically engaged time and behavior are connected strongly to student achievement. Best practices in MTSS thereby support appropriate and acceptable behavior and bolster student achievement, and can result in less reactive interventions and a greater concentration of scarce personnel and program resources onto students in greatest need. In sum, MTSS leverages the full array of instructional resources strategically and purposefully in a systemic and cooperative fashion for the sole purpose of improving student achievement and behavior. When implemented with fidelity and used as a robust and data-driven decision making process, MTSS results in significantly greater percentages of students achieving on grade level and likely meeting the Common Core State Standards. Moreover, the system leads to greater student engagement and decreased discipline referrals, as well as fewer students requiring special education services. MTSS can also help reduce the disproportionate representation of students from various racial/ethnic groups and those with developing levels of English proficiency in the ranks of those requiring special education services. The reason for this potential outcome is that with MTSS, the needs of such students can be met at the outset of the instructional process rather than after they begin to slip behind. Finally, this system of tiered instruction is particularly important because the new, higher academic standards will undoubtedly reveal deficits in current instructional practices, as well as weaknesses in academic achievement. The Common Core State Standards should improve educational outcomes over time, but they could also reveal a history of inadequate instruction and may exacerbate achievement gaps. To mitigate this possibility, MTSS can be used to ensure that all students, including those who are excelling and in need of enriched instruction and activities, have full access to effective instruction and supports from the start in order to achieve better outcomes. Finally, this system of tiered instruction is particularly important because the new, higher academic standards will undoubtedly reveal deficits in current instructional practices, as well as weaknesses in academic achievement. The Common Core State Standards should improve educational outcomes over time, but they could also reveal a history of inadequate instruction and may exacerbate achievement gaps. To mitigate this possibility, MTSS can be used to ensure that all students, including those who are excelling and in need of enriched instruction and activities, have full access to effective instruction and supports from the start in order to achieve better outcomes. 10. The engagement of parents and caregivers. This entry was posted in Common Core, EDUCATION, LL1885, The Articles and tagged MTSS, Multi-Tiered System of Supports. Bookmark the permalink. Watch for these to show up in Titles 1, 2, 3, 4, and 9. I just attended a webinar on Title 1 and all I can say is ‘wow’ (and not because it is a good thing). Title 4 via ESSA will put the screws to us in block grants. WOW how did we ever survive before all of this? We educated some of the greatest minds in history in one room school houses and the kitchen table. This is nothing more than an effort to stress out our kids and make a ton of money for those that apparently already have too much money and too much free time on their hands.